According to The Cambridge Encyclopedia of the English Language, English is used, at different levels, over 75 territories around the world. These territories range from the United Kingdom and the United States of America, where English is the dominant language, Ireland and Canada where it is the official language, to Kenya and Tanzania, where English has lost the formal status it once had, though it still plays an important role in the community. In many cases, it coexists with other local languages. But in all cases, the population is living in an environment in which the English language is part of the nation’s recent or present identity. The grand total of English language users, rounded up, is 2,214 million, which is well over a third of the world’s population. In this total we include people who have English as their first language (L1) but also those who use it as a second language (L2). 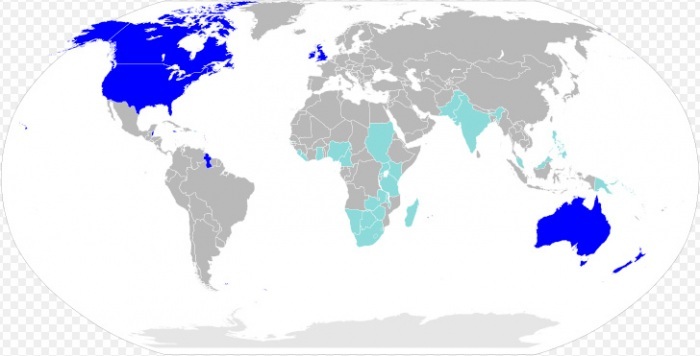 Apart from Australia, Canada, Ireland, New Zealand, the U.K. and the U.S.A, where it is the primary language, English is used in many countries in Asia (including Singapore, India and Malawi) and Africa (such as South Africa and, to a lesser extent, Liberia o Sierra Leone). CRYSTAL, David. The Cambridge Encyclopedia of the English Language. Cambridge University Press, 2010. A language which is not a person’s mother tonge, but which is used in order to meet a communicative need.